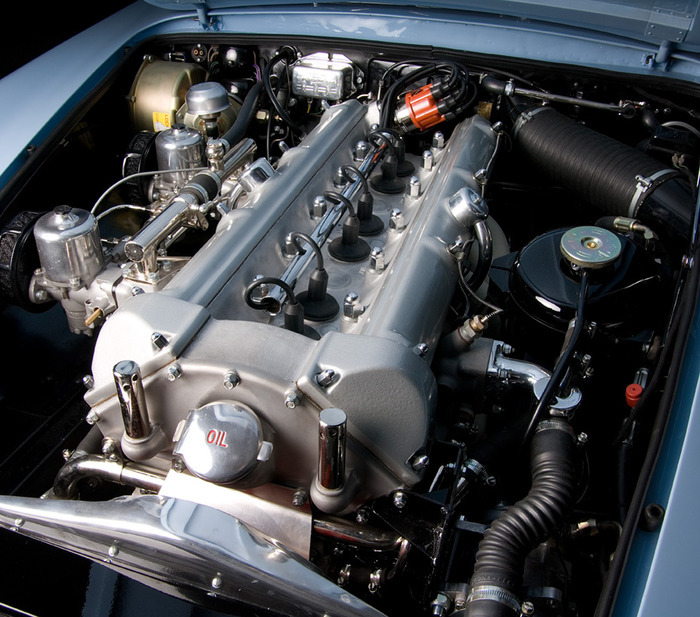 The Aston Workshop DB4 “Bullet" engine came about after identifying the need for a power and torque increase whilst retaining the originality of the twin S.U carburettors. To produce the "bullet" engine we implement a high number of internal improvements and modifications, none of which are easily detectable. The standard 3.7 litre DB4 cylinder block is a sound starting place for the capacity upgrade to 4.2 litre. The 3.7 litre engine does not suffer from the "usual" cracking of the bottom cylinder liner locations common among the 4.0 litre DB5 & 6. To accomplish the upgrade the cylinder block is machined for the oversize liners and the oil and water ways are upgraded. New valve cotters and the replacement of all studs. The ports are modified to improve air flow and matched to the inlet manifolds. New "special" Aston Workshop camshafts are also fitted. TV damper / pulley assembly. The result is an engine package providing a substantial increase in torque and power right across the rev range.